Heavenly Wedding Banquet–The Bible teaches us the spiritual world through many things. One of the ways is through a parable. God uses parables to reveal the secret of the kingdom of heaven only to the children of God. What is the secret behind the parable of the heavenly wedding banquet? Therefore, as children of God we have to open our spiritual eyes and ears. And we have to listen to the teachings of God in those parables. Then now let us study a parable of the heavenly wedding banquet. And let us find out the existence of God the Mother who would give eternal life. The bible teaches us that each parable contains a deep secret of the Kingdom of heaven that we have to know to enter the kingdom. When we have a key to a house, we can open its door and enter. Likewise, the secret hidden in the parable works like a key. Therefore, if you know the secret of the parable, you can use the secret as key to enter heaven. Then how important it would be to know the secret of a parable! Therefore we have to find out the secret of the parable of the heavenly wedding banquet. It is because the secret in this parable is the key for the kingdom of heaven. Now, let us find out the hidden secret in this parable through the teachings of Jesus in the bible. Matthew 22:1~10 Jesus spoke to them again in parables, saying: 2 “The kingdom of heaven is like a king who prepared a wedding banquet for his son. 3 He sent his servants to those who had been invited to the banquet to tell them to come, but they refused to come. ….. 8 “Then he said to his servants, ‘The wedding banquet is ready, but those I invited did not deserve to come. 9 So go to the street corners and invite to the banquet anyone you find.’ 10 So the servants went out into the streets and gathered all the people they could find, the bad as well as the good, and the wedding hall was filled with guests. 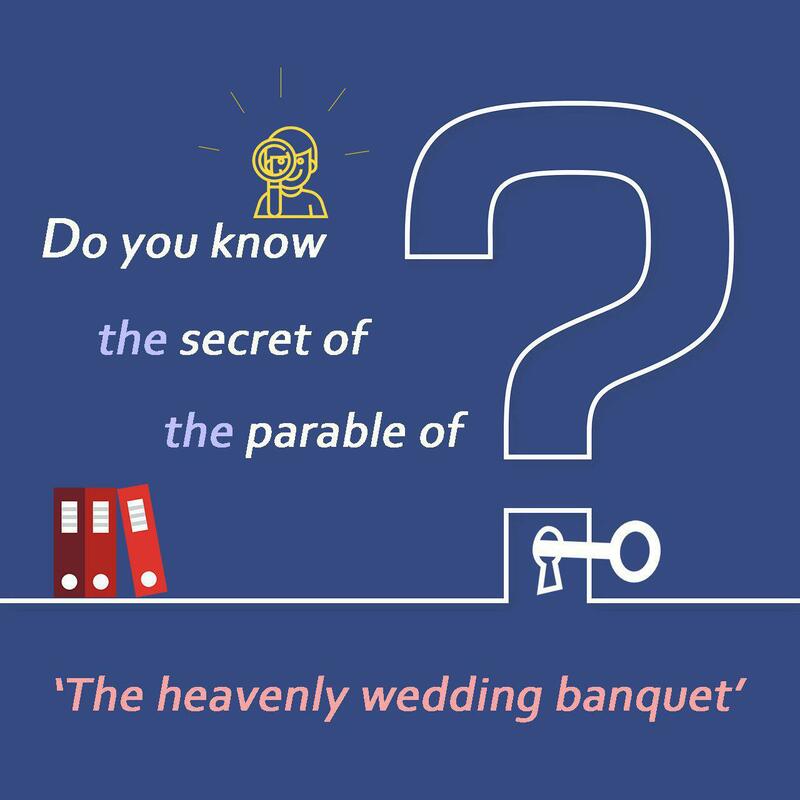 Then what is the hidden secret in this parable of the heavenly wedding banquet? Jesus compared the kingdom of heaven specifically to a wedding banquet. Why not a birthday party? Why not just a party for the son? There could be many different reasons for the celebration. However, the bible specifically says that this celebration was thrown for the wedding of his son. Therefore, we have to think carefully about a wedding banquet to figure out the reason. How is a wedding banquet different from other celebration? For the wedding banquet to be fulfilled, three things must come together: the bridegroom, the bride and the guests (or the witnesses). When we read the parable above, we can easily notice two components of the wedding, the bridegroom and the witnesses. The bridegroom is Jesus himself, the son of the King of Heaven (or God). And the witnesses are those who were invited to the wedding. However, reading from the beginning to the end, we cannot find any mention of the bride. Then can we say that the bride is not necessary? Definitely not. If there is no need of the bride, God would not use a parable of the wedding banquet. Rather, He would compare the kingdom of heaven through a parable of the birthday party. In that way, the son and the guests would be enough for the parable. Since Jesus compared the kingdom of heaven through the parable of the heavenly wedding banquet, we have to know who the bride is. In this parable, the bride is hidden. This means the bride is the secret of this parable. Therefore, the bride is the key for the kingdom of heaven in this parable. For this reason, Finding out the identity of the bride is most important in this parable. Then who is the bride? When would she appear? Many might think this would be very easy to answer. The bride is the saints or the church. If then, who would be the guests or those who were invited to the banquet? In another parable of the heavenly wedding banquet, Jesus clearly teaches that the guests are the saints of God. Mark 2:18 Now John’s disciples and the Pharisees were fasting. Some people came and asked Jesus, “How is it that John’s disciples and the disciples of the Pharisees are fasting, but yours (Jesus’ disciples) are not?” 19 Jesus answered, “How can the guests (Jesus’ disciples) of the bridegroom fast while he is with them? They cannot, so long as they have him with them. 20 But the time will come when the bridegroom (Jesus) will be taken from them, and on that day they will fast. Throughout the parable of the heavenly wedding banquet, the bride and guests have distinctive characteristics. Therefore, we cannot say they are the same. They are different. Then who is the bride of Christ in this parable of the heavenly wedding banquet? To find out the identity of the bride, we have to go back to the bible? Let us first think about the appearance of the bride. When would the bride appear? To find an answer for this question we have to ask another question? Whose bride is she in the parable of the heavenly wedding banquet? She is the bride of the Son of God, that is, Jesus, right? Since she is the Bride of Christ, she would appear with the Christ himself. 2000 years ago when Christ came, however, he did not come with his bride as we have seen through the parable of the heavenly wedding banquet. Therefore, we can conclude that the bride would appear when the Christ comes for the second time. The bible teaches us that the Christ would appear for the second time for our salvation. (Hebrews 9:28) Consequently, it would be natural to conclude that he would appear with his bride in his second coming. Who is the true bride of Christ in the Book of Revelation? Apostle John saw the vision of the end time and recorded the Book of Revelation. In that book, he describes the Christ’s coming for the second time to give us salvation. When he comes, the bible says that he would complete the heavenly wedding banquet by coming with his bride. 2000 years ago, Jesus taught the kingdom of heaven through the parable of the heavenly wedding banquet. In that parable, there was one secret, that is, the identity of the bride of Christ who would work as the key for heaven when revealed. However, she was the hidden secret at his first coming. Finally, in the last days, the bible teaches that the heavenly wedding banquet would be made complete through the appearance of the bride, the secret of the parable. In the Book of Revelation, we can see the appearance of the bride of Christ. Through the appearance of the bride of Christ, finally all the components for the heavenly wedding banquet are present. We have the bridegroom (Jesus the Son of God), the guests, and the bride who is the last secret of the parable. Then who is the true bride of Christ? To understand the secret of this parable, we have to get rid of all our prejudices and expectation. Rather, we have to focus on the words of God in the bible. Then who is the bride of Christ? Revelation 21:9 One of the seven angels who had the seven bowls full of the seven last plagues came and said to me, “Come, I will show you the bride, the wife of the Lamb.” 10 And he carried me away in the Spirit to a mountain great and high, and showed me the Holy City, Jerusalem, coming down out of heaven from God. An angel said that he would show the bride, the wife of the Lamb (Christ). Actually, what John saw was “the Holy City Jerusalem” coming from heaven. In other words, the bride or wife of Christ is the heavenly Jerusalem. Then what is the heavenly Jerusalem? Would it be a real city coming from heaven? It would be so naïve for us to believe like that. The bible speaks about two different realms, physical and spiritual. For instance, let us look at the temple. When Moses built a physical tabernacle or temple, he modeled it after the spiritual temple in heaven. Therefore, we have two different temples in the bible, the physical and spiritual. The physical temple was built in the image of the spiritual heavenly temple. Therefore, to know the spiritual invisible temple, we have to first look at the physical temple. Then what was the reality of the temple God wanted to teach us through the physical temple on this earth? What was the true spiritual temple? John 2:19 Jesus answered them, “Destroy this temple, and I will raise it again in three days.” 20 They replied, “It has taken forty-six years to build this temple, and you are going to raise it in three days?” 21 But the temple he had spoken of was his body. In this scene, we can witness the existence of two different temples. Jews were speaking about the physical temple Jerusalem in the city of Jerusalem. But Jesus was speaking about the reality of the temple, that is, the body of Christ. Jesus was teaching them that wherever the Spirit of God is that place is the temple of God. God once put His Spirit in the Jerusalem Temple. And there on the throne of God between the cherubim, He worked for his people as spirit. However, when he came down to this earth in the name of Jesus, God put His Spirit in the body of Christ. Since then, the body of Christ became the temple of God. Now, we can see the physical and spiritual temple at the same time in this scene. In the verse above we are watching the physical temple Jerusalem and spiritual temple of God right in front of us. Then can we find any similarities between them? Do they look alike in any way? Is there any physical resemblance between them? Not at all. The Jews who had only physical eyes could not see the real meaning of Jesus’ words. They could not understand the secret meaning of the parable of the temple. Then how about the disciples of Jesus? They could understand the secret of the parable. And they correctly recorded “the temple he had spoken of was his body”. It is the same with us. We must open our spiritual eyes and should understand the spiritual meaning behind the parable. We should not think a huge building would come down from heaven as the bride of Christ to give us salvation. Then who is the heavenly Jerusalem? We can find the answer for this question through the bible. The bible is the medium God gave us to let us know the spiritual things and spiritual world. Then what is the heavenly Jerusalem in the bible? Galatians 4:26 But the Jerusalem that is above (in heaven) is free, and she is our mother. The bible says the bride of Christ the heavenly Jerusalem is our Mother or God the Mother in heaven. Just as we have our Father in heaven, we have our Mother in heaven. Our Father in heaven came down to this earth as reality of the temple. In the same way, the bible shows us that our Mother in heaven would come down to us as the reality of the Most Holy Place. When she comes down to earth as the bride of Christ, finally the parable of the heavenly wedding banquet would be complete. 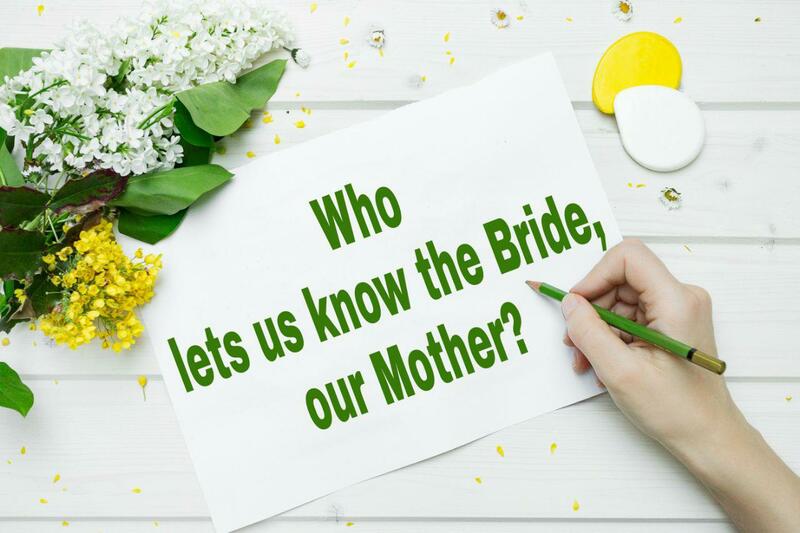 Then why should our Mother appear as the bride of Christ in the last day? Christ would come for the second time to give us salvation. In the same way, to give us salvation God the Mother is coming down from heaven to us too. Without the appearance of the Bride God the Mother, the heavenly wedding banquet cannot be made complete. And without the completion of the heavenly wedding banquet, the guests or God’s people cannot receive salvation. Think about the wedding. What is the purpose of the wedding banquet? Through wedding, a man and woman become husband and wife. And together they give life to their children. Through this physical wedding banquet, God is teaching us the meaning of the heavenly wedding banquet. Through the completion of the heavenly wedding banquet, God the Father and God the Mother can give us the salvation of eternal life. In this sense, we can see the last hidden secret of this parable of the heavenly wedding banquet. It means God the Mother is the key for the entrance of the kingdom of heaven. Therefore, without heavenly Mother we cannot receive the salvation of eternal life. Finally, to complete the heavenly wedding banquet, God the Mother the heavenly New Jerusalem came down to us. And she is calling us to come to receive the eternal life. Revelation 22:17 The Spirit (God the Father) and the bride (God the Mother) say, “Come!” And let the one who hears say, “Come!” Let the one who is thirsty come; and let the one who wishes take the free gift of the water of life (eternal life). Come to the Spirit and the Bride for the water of life. Receive Heavenly Jerusalem our Mother because she is the one who gives us eternal life. This entry was posted in God The Mother and tagged Appearance of God the Mother, Eternal life, God the Father And God the Mother, God the Mother, Heavenly Wedding Banquet, Hidden Secret, Jesus Bridegroom, Last Mystery in the Parable, Parable of Heavenly Wedding Banquet, Physical World and Spiritual World, Saints Guest, The Spirit and The Bride, Water of Life. Bookmark the permalink. In this age, the Spirit (God the Father) and the Bride (God the Mother) give us the water of life or eternal life (Rev 22:17.) We should believe in God the Mother as well as God the Father to get salvation and enter the kingdom of heaven. I hope that everyone will be saved by believe in Heavenly mother who have come to this earth as the Bible testified. I thank Elohim God for allowing me to understand the word of parable. We should be the ones who will join God the Father and God the Mother who give us the water of life and participate in Heavenly wedding banquet. It’s awesome!! Who could explain this profound secret of God to us? Only God Himself!! So, Christ Ahnsahnghong came to this earth a second time according to the prophecy(Heb :28) and let us know all the secrets about God and God’s redemption plan in the Bible. The parable of the Heavenly Wedding Banquet is one of them. I give all thanks and praises to Him for leading me to the source of eternal life, Heavenly Jerusalem Mother. The secret of Kindom of heaven is given to us ,not to them. This sentence really make me feel that I really meet real God in this world. All the prophecies on the bible is achieved. In the last ages which we are living now, unless we realize God the mother, we will be reallt poor peoples… fortunately, God the father acknowledge us God the mother and we got to know how to go kingdom of heaven. Thanks God the father and mother!!!!! In heavenly banquet, the bridegroom and the bride are not the one who was invited. The bride who give us blessing of eternal life is the savior who lead us to kingdom of heaven. 2000 yrs ago Jesus came alone without His Bride. And He has come with the Bride in these last days according to the prophecies of the Bible. The Spirit and the Bride are calling and inviting us to the heavenly wedding banquet. How grateful! Thanks to God the Father and God the Mother for calling me to be invited to the Heavenly Wedding Banquet. I will deliever this good news to people around me as much as I can. As we can see the providence of God about life, God chose a mother as the last life giver. It is to teach us that our spiritual Mother will appear and finish the salvation work by giving us eternal life at the end. Considering the parable of Heavenly Wedding Banquet in the Bible, we can understand why our spiritual Mother showed up in this last age. Jesus prophesied about god the mother through the parable of the heavenly banquet in this age. Thanks to God the father for guiding us to God the mother. In this age, Christ Ahnsahnghong revealed the hidden secret in the Bible for the salvation of our souls! It’s the truth of God the Mother! Without receiving God the Mother in the flesh? Then, there’ll be no place in the kingdom of heaven for him. She is the source of eternal salvation! I truly give thanks to Christ Ahnsahnghong and Heavenly Mother who opened our spiritual eyes and ears by God’s blessing. Let’s not forget the value of this precious salvation that can not be changed with anything! Our spiritual eyes opened by Christ Ahnsahnghong and Heavenly Mother’s grace and we could realize the spiritual meaning behind the parable of Heavenly Wedding Banquet. The real meaning and reality of the Heavenly Jerusalem is the our Heavenly Mother who will appear as the Bride of the Spirit in this last age. I hope that many people will be children of God who are saved by realize the secret of the kingdom of heaven through ‘The Parable Of The Heavenly Wedding Banquet’. Heavenly wedding banquet is very clear truth about Heavenly Mother. The people who deny God the Mother are those who deny words of Jesus. I’m so happy because I have met God the Mother in the WMSCOG. We came to realize this as very good news and valuable things as long as we understand truths, for example Heavenly wedding banquet. I can say that this article is very easy to understand God the Mother. Even thoug we are invited in the Wedding Banquet, if there is not bride, what happen? Bride is very important part of Wedding Banquet. And we can share the bless. I had lived without knowing God. But after hearing Elohim God’s voice through the Bible, I couldn’t help surprising at the secrets of all parables in the Bible. That is existence of God the Mother as well as God the Father to us. Oh~ how surprising! Amazing how the bible testifies about God the Mother ! To enter the kingdom of heaven, we must take part in the heavenly wedding banquet believing in God the Father Christ Ahnsahnghong and God the Mother Heavenly Jerusalem! God’s plan for lettting know us Who is Bride is profound. Life is vain if you don’t know the existence of Heavenly mother. I hope that many people meet Heavenly mother and find the meaning of real life. Wr can see whatever we know. We can also hear whatever we accept. If we know only God the father, we can only see him. What the Bible tell us about God the mother? Can u see or hear? I thought church was the wife of Christ. It’s amazing that Jesus said church is guests, not the bride. Through the parable of heavenly wedding bankquet it is so clear that the bride represents heavenly mother! It’s like heaven’s key to realizing God the Mother. Thank you Elohim God for this understanding. Bible clearly testified exists of Heavenly Mother through all things. People will receive the blessings of eternal life who believe in God the Mother. Please come to WMSCOG and accept the God the Mother! It’s tremendous blessings that we know and receive God the Mother the key of entering the Kindom of Heaven! Thanks to Father Ahnsahnghong and Heavenly Mother for giving me eternal blessing!! Through the parable of heavenly wedding banquet God reveals the existence of God the Mother as the Bride of the Lamb. So we can realize that God the Mother gives us eternal life. I didn’t know that the Bride is so meaningful…. this post changed my perspective about the Bride. i must see more prophecies of the Bible about mother God. I feel that i could miss something important in my life. I give thanks and glory to Elohim God who invited us to the Heavenly wedding banquet for our salvation. Amazing! I would like to be given invitation of Heavenly wedding banquet:) The explanation was very clear and made me understand the reason why existence of God the Mother. Jesus said very clearly He has wife through the parable of wedding banquet and the revelation which he gave to John. Jesus’ wife is our heavenly Mother without needing to say again. The eternal life that Jesus will give us on the last day is given through the Heavenly mother who came to the end of the days. Heavenly mother, We are thank you for your coming ! God the Father and God the Mother have come to fulfill the prophecy about heavenly wedding banquet and call us to kingdom of heaven. Thanks to Them. Heavenly Father and heavenly Mother have come down out of heaven to the earth to give us the water of life.Whoever was invited to heavenly wedding banquet must come whatever happens.Only those who drink living water in wedding banquet will be blessed with eternal life for heaven’s kingdom. A wedding feast is a happy day. It is the day when the bride and groom are married, the saints likened to the guest are going to heaven.